The ideal Shiloh is a social, responsive and a reliable companion, whether at home or amongst strangers. However, this breed should also possess a special sensitivity, a unique intuition, which enables them to quickly detect a dangerous situation or become alert to someone or something which poses a threat. The best Shilohs have inherited traits from their ancestors, the original, "Old World" German Shepherd Dogs. The Shiloh Shepherd should instinctively protect their family and friends if a serious need should arise. They should serve naturally in the role of a guardian over children, their master's property, personal belongings, including livestock or other household pets. Some Shilohs have actually displayed live saving tendancies by performing heroic deeds which rescued various innocent victims in times of peril. For those Shiloh owners interested in a certain relationship based on trust & bringing security - be sure to consider the pursuit of training for Protection Sports. Canine candidates for Protection Sports must be friendly, totally confident in all situations, agile, athletic, and physically sound. Protection Sports are all about ultimate obedience while under stress and distraction - where the handler's control is developed to an "art form" through positive reinforcement methods. Combine this with your Shiloh's desire to please you and their excitement will clearly be visable - leaving no doubt that your dog enjoys his/her work and is thrilled with the prospect of competition. If you have a Shiloh who just loves to be the center of your attention and "show off" his/her skills just to hear the applause at ringside - I strongly suggest you check it out! SERVICE DOGS OF AMERICA is offering new and refreshing opportunities in Dog Sports, especially in Protection. They are encouraging any and all dogs to become members and participate in their events and assure that each and every one will be welcome! Protection Dog Alert Title - (Courtesy of the SDA) This test was created to provide a Protection Title for a wide variety of dogs. In addition, this title allows people who may be opposed to a biting dog, but are not opposed to having a warning dog, an opportunity to train and learn of both obedience and protection. It is the perfect title for introducing new people to the pleasures and benefits of protection training. Protection Dog 1 - The SDA is proud to introduce a protection title we believe will become one of the most popular and desirable protection titles in the USA. Protection Dog 2 & 3 - Every exercise required was selected on its criteria of being useful, practical, fun to train, necessary for testing, its entertainment value to watch and identifying breeding stock. For others who prefer the military, formal fashion of traditional SCHUTZHUND TRIALS which originated in Germany and still continue today, there are multiple regional clubs throughout the world and these tests are fairly available and accessible. 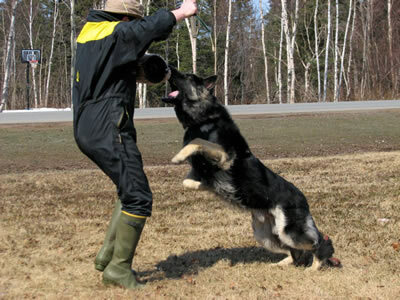 In addition, SCHUTZHUND TITLES have International recognition. These clubs not only offer special seasonal memberships which align with their trial schedules, but they may also offer discounted dues for training in preparation for such a trial. They are mainly geared toward hard hitting, high energy dogs with intense responses via their prey drive. 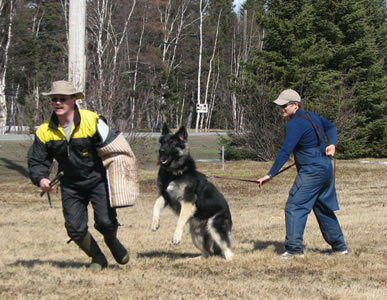 Representatives of SCHUTZHUND CLUBS point out that the bitework competition is basically an extension of the "the tug game". Truthfully, it is more of a fierce illusion, however frenzied the dog appears, it actually has nothing to do with training attack dogs. The overall power of the team's working performance - that is the incredible prize in itself! The PROTECTION SPORTS ASSOCIATION was founded in November, 2002. They have gained the active support of over 30 training clubs and instructors across the US. The standard divisions of Novice and Open are available for beginners and on up through Level 2 and Level 3. Any Shiloh who completes the requirements for any given class of a PSA Trial will be awarded an official PSA Certificate Of Title. This highly competitive organization promotes Championship Tournaments where you will find some of the best protection sport dogs in the country. The PSA rewards the ultimate high scoring performances with cash prizes!